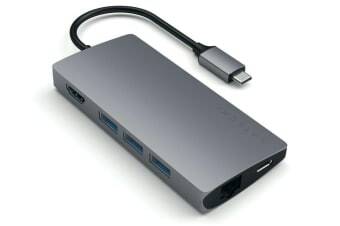 One Type-C port, multiple connections! 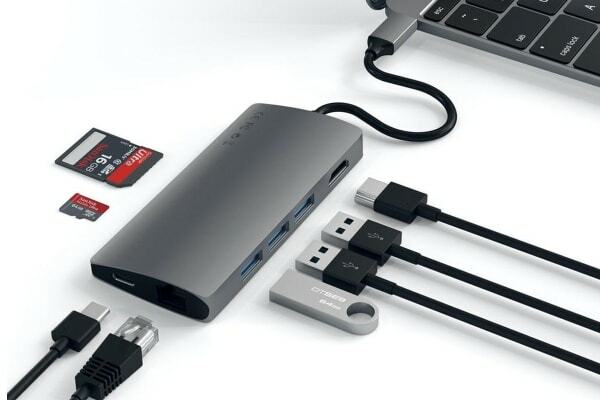 Utilise a plethora of connections to your laptop or desktop with the incredibly simple and convenient Satechi Type-C Multi-Port Adapter V2. Never get stuck without a charging cable. The clever design includes pass-through charging, enabling you to easily charge a Type-C Device while using the other included outlets – maximising the time you can spend on work or play. Stunning 4k visuals – on the go. The Satechi Type-C Multi-Port Adapter V2 makes it so easy to enjoy crisp, high-resolution displays (up to 4K at 30Hz resolution). Simply connect a HDMI cable from your Multi-Port Adapter to a 4K monitor and beautiful imagery awaits you. Streaming internet has never been easier, simply connect an ethernet cable from the adapter to a router to enjoy superfast Gigabit Ethernet. Three USB Type-A ports, SD and Micro SD Card slots ensure this adapter meets all your needs. The stylish and sleek aluminium design will fit in with all of your existing tech, making it now easier than ever before to add expansion ports to your MacBook/MacBook Pro. 2016/2017 MacBook Pro 13" | 2016/2017 Pro 15" |2015/2016/2017 MacBook 12"